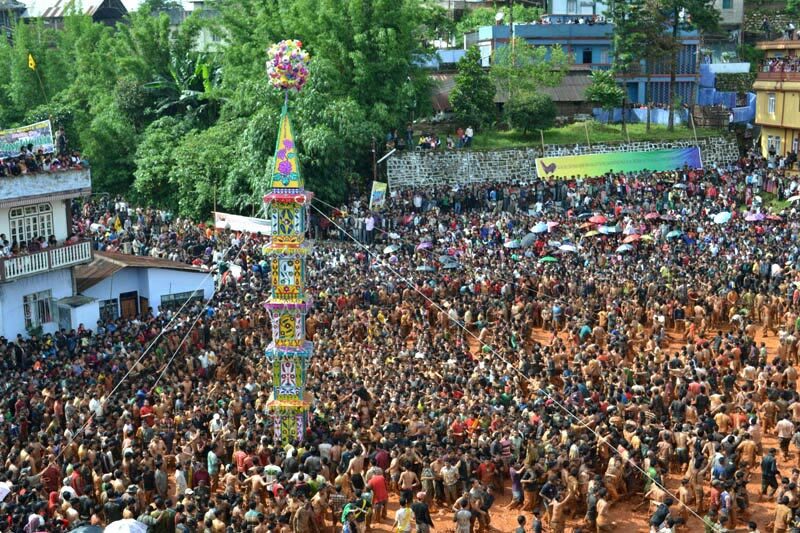 JOWAI: Behdeinkhlam, the most colourful and important religious festival of the Pnar people belonging to the Niamtre, a traditional faith was concluded with religious fervour and spirit of fun and merriment here on Friday. The faithful believe that the four-day festival organised by the Sein Raij Jowai drives away the “plagues, devils and all kinds of evil spirits” from the society. The last day of the festival was witnessed by thousands of spectators from across the State and even abroad. Members of the Sein Raij Jowai, Sein Raij Shillong, Ummulong joined the festival dancing in the sacred muddy pool to the tune of the beat of drums and sound of cymbals. Governor RS Mooshahary, Minister in-charge Municipal Administration Ampareen Lyngdoh, Deputy Chief Minister Bindo N Lanong, Wahiajer MLA Sniawbhalang Dhar and senior government officials also witnessed the festival. The festival on Friday began with a ritual called Kyntin Khnong at the priestess’ (Langdoh) official residence followed by Bam Tyngkong performed by the religious head, the Dolloi, along with his “ministers” including the Pator, Sangot and the Maji. Later, the Wasan or the elders visited every house and performed Shoh Thyndai – a beating of the roof with a stick called Deinkhlam to drive away plagues or any kind of sickness and evil spirits from the house. The Wasans also offer a prayer in every house they visit so that the family would be blessed and protected from all sorts of evils spirits and sickness. In the afternoon, the festival begins at Aitnar, the sacred muddy pool, with the arrival of the Symbud Khnong (the spiritual wood). Only after the arrival of the Symbud Khnong, the members of ka Niamtre locally known as Ki khon ka Niamtre dance in the muddy pool. Raths or Rots, colourful tower-like structures or paper monuments, were brought and displayed by various localities before they were finally immersed. Each colourful Rot representing by various localities had depicted various social issues. The Rots brought by Sein Raij Shillong depicted social issues confronting corruption and the work culture of the government who failed to solve various problems including border disputes, arrear of school teachers and others. Dat Lawakor, the other part of the festival, is a ritual performed in the form of a football match with a wooden ball but no goal post on both sides and players have to follow only east and west directions. The ritual was performed between the team of U Langdoh and the team of U Sangngot Paswett. It is believed if any team won the match, one of the two valleys around Jowai known as Pynthor nein and Pynthor wah will yield a good harvest. This year, the team of U Sangngot Paswett won the match and it indicates that Pynthor wah would reap more harvest than the Pynthor nein. To mark the conclusion of the festival, elders of the Niamtre-Sein Raij Jowai including the Dolloi perform Bam Tyngkong at the residence of Ka Langdoh, the priestess, followed by Wai-sarang.